The names are familiar to all of us who spent our childhoods delivering flying elbows from the top turnbuckles of our living room couches and putting our friends in figure four leg locks. We spent many a Saturday morning and Monday night watching The Macho Man Randy Savage leap off the top rope in all his manic, technicolor glory or wincing as the monstrous Yokozuna powerslammed some poor sap into the canvas with every ounce of his 700 pound body. We hated the scheming, whiny Owen Hart for trying to steal his big brother Bret’s glory and we loved it when The Road Warrior Hawk would come out with his tag-team partner Animal, looking like a Mad Max villain decked out in full war paint and shoulder pads with giant spikes sticking out of them. We saw The British Bulldog strut around the ring with Union Jack tights and biceps so big they were practically thighs and we loathed Bam Bam Bigelow for his doughboy body and flame broiled head. Our dads told all of us that wrestling was fake, but we knew better. We knew that what these men did night in and night out was a matter of life and death. And it turns out we were right, because every one of the men I just mentioned but one1 died before reaching 50 and none are with us today. Hundreds of professional wrestlers have died prematurely over the past 30 years and I suspect my average reader doesn’t have the time or patience to be subjected to a comprehensive list. To put it into perspective, the WWE (formerly the WWF) recently put on the 1,000 episode of their show Monday Night Raw this summer. 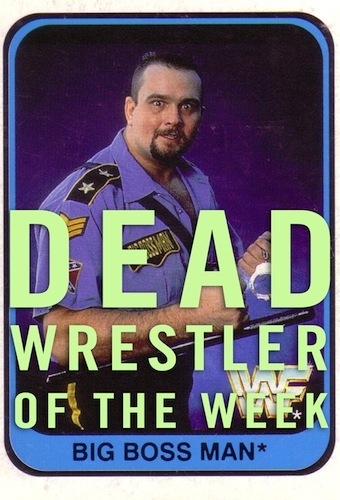 Since the first episode ran in 1993, 28 wrestlers who appeared on the program have died under the age of 45. For a sport with such a small active roster of athletes/performers, this is a staggering number of deaths. By comparison, there have only been 21 active NFL players who have died in that same period of time. Those mortality figures sound similar until you realize that there are currently 1,696 active players in the NFL and there are only about 70 active wrestlers in the WWE. Using that 70 wrestler roster as a benchmark, the WWE has seen 3% of its roster die every year for the last 19 years. I defy you to find another non-military profession in the United States that loses 3% of its workers every year. Now, you may be wondering why I’m covering this issue at all. Isn’t Virally Suppressed supposed to focus on issues of social justice and political malfeasance and HIV-related issues? Why the hell is this guy waxing poetic about reverse suplexes when we’re in the muck and the mire of an election year? Well, conveniently insightful fake reader, I’m writing about the medieval life expectancy of professional wrestlers because it could have a direct effect on the makeup of the US Senate come November 7th. 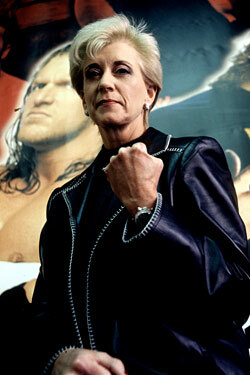 For the second time in three years, former World Wrestling Entertainment CEO Linda McMahon is spending a small fortune to try and become Connecticut’s next senator, this time eyeing the seat being vacated by retiring Independent and basset hound impersonator Joe Lieberman. While less visible than her ‘roided out sociopath of a husband, WWE co-founder Vince McMahon, Linda served as head of the organization for 16 years beginning in 1993 and is responsible for much of its success. However, with the spoils of that success comes the culpability in running one of the most immoral, exploitative industries in America. Unlike every other major sport, wrestlers don’t have a union and that has meant that they have historically been treated with the dignity and consideration normally afforded to a used handi-wipe. The WWE classifies them as “independent contractors,” which is odd considering they are full time employees and under contract to exclusively wrestle for the WWE. But, this is not merely a technicality when it comes to wrestlers’ well-being because, as independent contractors, the federal government views them as being self-employed. As a result, these wrestlers are not provided with any benefits and they are required to pay what is known as the self-employment tax. Thanks to the Federal Insurance Contributions Act tax, when you are an employee of a company you split social security and medicare taxes with your employer so that you each pay a 6.2% share of the Social Security tax and 1.45% of the medicare tax. But, thanks to being labeled as independent contractors, pro wrestlers have to pay the full 15.3% FICA percentage, which saves the WWE millions of dollars every year. The biggest part of this whole scam revolves around benefits, or lack thereof. Up until last year, WWE wrestlers were not required to have health insurance. When Linda McMahon began revving up for her second run at congress in 2011, the WWE mandated that all of their employees get health insurance, but said that they had to pay for it themselves. What company in the history of ever can you think of that has required its employees to pay for their own health insurance? To add literal and figurative insult to injury, the violent nature of their profession means that insurance premiums for wrestlers are through the roof. The WWE touts that it pays for wrestling-related surgeries, but anything beyond that is seen as squarely being the responsibility of the wrestler. According to the US Small Business Administration, an independent contractor is defined as someone who, among other things: operates under a business name, has his/her own employees, maintains a separate business checking account, advertises his/her business’ services, has more than one client, has own tools and sets own hours and keeps business records. On the other hand, the US SBA defines an employee as someone who: performs duties dictated or controlled by others, is given training for work to be done, and works for only one employer. Which category do you think professional wrestler’s should fall into? Why does this matter do the people of Connecticut and, by extension, the entire nation? This matters because Linda McMahon will attempt to run government with the same lack of respect for human life that she did her wrestling organization. This is a woman who has already stated at a Tea Party forum that she wants to put a “sunset provision” on Social Security. What that means is anyone’s guess as she was light on specifics, but by definition a sunset provision is a measure within a statute that mandates the it will cease to exist if further legislative action is not taken by a certain point. Essentially, it would be an execution date for Social Security unless certain GOP-friendly changes were made, which in McMahon’s case involve means-testing benefits and raising the age of eligibility. I’ve included a video below, because I can’t describe the pain and desperation of former-WWE wrestlers who have been led out to pasture as well as they themselves can. This is the first half of a 2003 Real Sports investigation into the rash of premature deaths in professional wrestling and it is haunting. Listen to Roddy Piper talk about looking around and seeing all of his friends dead around him and ask yourself if you want the woman who denied these men health benefits and ran them to the bone representing one of our states in Congress. 1Savage is the elder statesman of this group of deceased wrestlers, having died at the comparatively old age of 58 in 2011 after suffering a heart attack while driving his Jeep Wrangler and crashing into a tree. Many media reports initially speculated that the car crash had killed him, coroners ruled that he had died of coronary artery disease and complications related to an enlarged heart, noting that he sustained only minor physical injuries in the crash. me in Washington. Thank You.